Lake Texoma is famous for the quantity of striper so we are able to catch a good amount of fish in the 10-20lb range. We can handle and size group and always work hard to put you on fish. 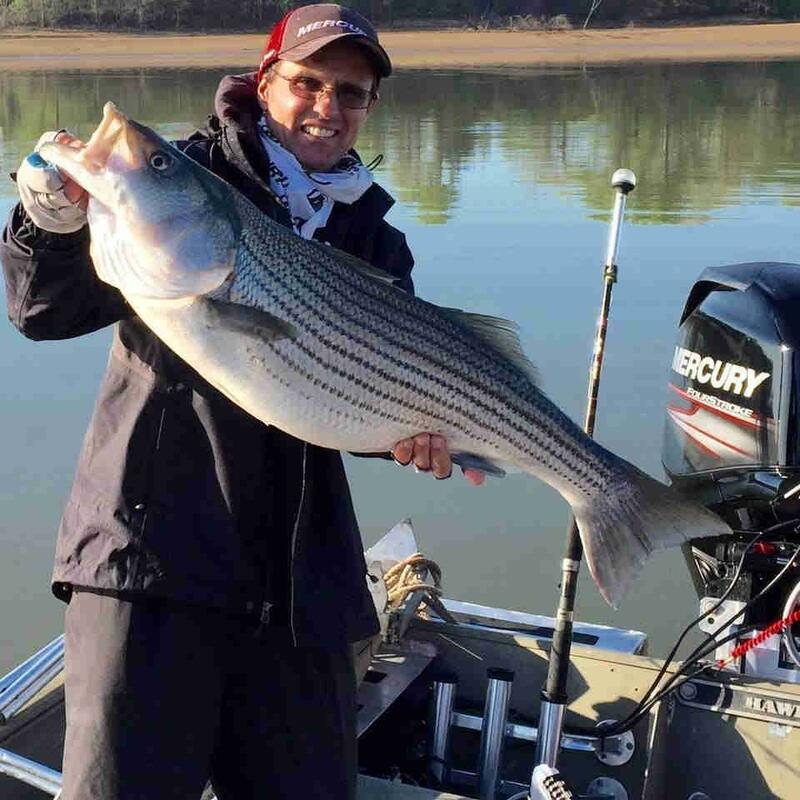 Lake Texoma Striper Fishing Guide fishing Lake Texoma with a fleet of big, safe and comfortable 27+ foot boats. We provide all quality fishing gear, tackle and bait. We also fillet and bag your catch. Capt. Steve provides high quality fishing trips at competitive rates. Capt. Steve grew up in Wichita Falls, TX and started his striper fishing guide career in 1994 striper fishing Lake Kemp and the Wichita River. Lake Kemp fishing went down hill in the late 90’s so Capt. Steve moved to Possum Kingdom lake where he built a strong fishing following only to have disaster strike again in January 2001 when golden algae devastated the striper population on Possum Kingdom. Not one to just sit around and wait, Capt. Steve loaded up and moved to Lake Texoma in March of 2001 where striper fishing and business has been good. Capt. Steve also started offering saltwater trips on the Texas coast in 1999 and continues to offer these trips every year from late July- mid October. Captain Steve specializes in catching big Lake Texoma striper in freshwater. In saltwater sharks, tarpon, bull reds, red snapper, king, ling, grouper, dolphin and amberjack. Lake Texoma Fishing Report Tuesday April 3,2018. Lake elevation is 616.51 and water temp at the dam is 58 degrees. Fishing this time of year is up and down much like the weather but it's like anything else in life you have to take a risk for the big rewards. May and June are usually a sure thing but if you are looking for the biggest striper of the year late February-mid April is usually your best shot at a trophy size pre-spawn striper. Fishing has been very good on Texoma the past few weeks for big fish and numbers have also increased over the last few days. This time of year fish can be any depth and anywhere on the lake so you just have to put in your time and take a chance. I prefer 5' swim baits in glow and chartreuse color this time of year but live bait can also be effective so for your best chance at a Texoma trophy striper book your trip now with your favorite Lake Texoma Striper guide and if you don't have a favorite do your homework before you choose one. Take a chance and you just might be rewarded with a fish like this 20.5 lb that we caught April 2nd.